Timothy Michael "Tim" Kaine (born February 26, 1958), a Democrat, is the pro-abortion junior United States Senator for Virginia, and the unsuccessful Democratic nominee for vice president in 2016, as chosen by Hillary Clinton. 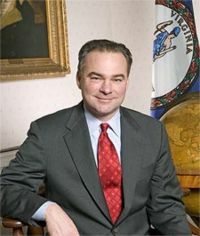 Kaine served as the 70th Governor of Virginia from 2006 through 2010. He was chairman of the Democratic National Committee from 2009 until 2011. Previously he served as Lieutenant Governor and Mayor of Richmond. Kaine won the governorship by running as a conservative Democrat. Kaine is not really pro-life — his endorsement was revoked by Democrats for Life, and he opposes overturning Roe v. Wade. Kaine does claim to support the Second Amendment. As Mayor of Richmond, he was credited with helping to create and implement Project Exile gun law, which shifts the prosecution of illegal gun possession offenses to federal court, rather than state court. Less than three weeks after his gubernatorial inauguration in Williamsburg on January 14, 2006, Kaine was selected to give the Democratic response to President George W. Bush's State of the Union address. In the 2008 Presidential Election, Kaine was frequently rumored to be on Democratic nominee Barack Obama's Vice Presidential short list. However, Obama selected Senator Joseph Biden of Delaware instead. Kaine said that Joe Biden would help Obama win Virginia; "Joe comes from the state Delaware that borders Virginia, the eastern shore part of Virginia and Delaware are not only bordering but very similar." This is factually inaccurate, in that Maryland is in between Delaware and Virginia. An October 2009 Public Policy Poll showed Governor Kaine with a 46% approval rating, with 39% disapproval. He left office in January 2010 with a $4.2 billion budget shortfall. Kaine announced on April 5, 2011, that he would run for the United States Senate seat held by retiring Democrat Jim Webb. He defeated former Republican Senator and Governor George Allen to win the seat in the 2012 election. In June 2006, Kaine signed an executive order banning smoking in all government buildings and state-owned cars. Signed a bill into law passed by the Republican-controlled state legislature that mandated HPV vaccines for sixth-grade girls. After the Virginia Tech massacre, Kaine appointed a commission to examine what the university knew about the student who killed 32 people. The commission was led by former Pennsylvania governor and Secretary of Homeland Security Tom Ridge. On April 30, 2007, Governor Kaine signed a bill that instructed state agencies to block gun sales to people who are involuntarily committed to inpatient and outpatient mental health treatment.